Outside of Japan, Kenichi Yamamoto isn’t a household name. Not the way Henry Ford and Carroll Shelby and Lee Iacocca are. Yet most people who enter the auto industry don’t get to produce one of the greatest alternative engines ever made, or oversee the development of one of the most beloved sports cars of all time. Kenichi Yamamoto got to do both. Yamamoto died this week at the age of 95, according to news reports. His life and career saw him rise from the literal ashes of post-World War II Hiroshima to key roles within Mazda, and along the way, he would help the automaker rise in much the same way. Along the way he brought the world Mazda’s Wankel rotary engine—and Mazda remains the only car company to ever really get it right—and the MX-5 Miata. 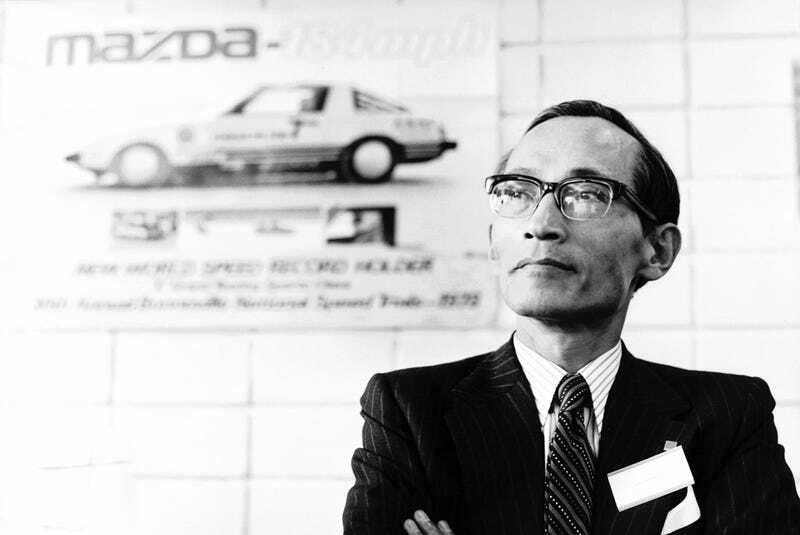 On two fronts, Yamamoto helped make Mazda the company it is today and inspired generations of enthusiasts along the way. On Aug. 15, 1945, the plant’s workers gathered to listen as the emperor, in a noon radio broadcast, announced Japan’s surrender. Japan had lost. In shock, everyone cried. Orders came to close the plant immediately, but it was a month before the three managers were told to go home. Unsure what to do, Yamamoto dithered for a week. Then, a letter arrived from his mother. As he had feared, his home was destroyed, and his sister, who had just graduated from high school, was dead. But his parents were alive, although his father was showing signs of radiation sickness. Please come home, his mother begged. So Yamamoto returned. “Toyo Kogyo,” as you may well know, was a manufacturing company that served as the original name of Mazda for many decades. At the behest of his family, and probably lacking many better alternatives, Yamamoto went to work there in 1946, working at a tiny and dirty plant where they built transmissions for those three-wheel trucks. The truck was a boon for the fledgling company. It proved vital to farmers and construction workers who sought to rebuild their country. Yamamoto rose within the company’s ranks, becoming deputy manager of the Engine and Vehicle Design Division in 1959, as Japanese Nostalgic Car notes. And in 1960 Mazda released its first real car, the R360 kei-car. What happened next is like how many great things in the car industry came to be: it almost didn’t. The Ministry of International Trade and Industry directed Japan’s economic development in the postwar period. Its agenda specified that Toyota, Nissan and Isuzu - not Toyo Kogyo - were to be Japan’s carmakers. Those companies not on the A-list were vulnerable because, without MITI’s support, bank financing would be iffy if not impossible to obtain. So Yamamoto’s rotary engine became a showcase. See what good technology we have, he and Matsuda argued. The Mazda brand stands for good engineering. We deserve a chance. Don’t let this brand die. This happened because earlier, Mazda had signed a technology agreement with German automaker NSU—which later merged with a company called Auto Union to become Audi—in order to develop Felix Wankel’s rotary engine for mass production. Company scion Tsuneji Matsuda feared Mazda would simply be merged into one of the larger automakers at the time, and he fell in love with Wankel’s rotary engine. So much so that he bet the farm on it, so to speak. But it was up to people like Yamamoto to actually make that happen. The Cosmo sports car debuted as a concept in 1963 at the Tokyo Motor Show. Yamamoto and Matsuda spent hours there explaining the technology to onlookers and financial titans alike, then toured across the country in the car to visit dealerships and banks. Using the Cosmo, and its magic spinning triangle engine, Yamamoto had to secure his company’s future on a wild idea. Maybe it was because Yamamoto was from Hiroshima, and he knew what desperate felt like, and that he knew it could be beaten. But it worked, and Mazda got its support from the Ministry of International Trade and Industry and ultimately the financing it needed. And in an interview with the New York Times in 1985, Yamamoto reflected on how this made his career. [...] For their loyalty and perseverence, Mr. Yamamoto’s team of 47 engineers became known as the ‘’47 Ronin,’’ after the legendary group of Samurai whose allegiance to their master was so strong that they avenged his death at the cost of their own lives. Yamamoto was president of Mazda by 1985 and board chairman by 1987. Through his career, he was a proponent of developing and using unique technology, and of thinking differently. This came in handy when an ambitious American automotive journalist named Bob Hall told Yamamoto in an interview that the company should build a small, lightweight, affordable roadster, like the British used to make, except this one starts every day because Lucas never made it to Japan. An early ’82 position paper Hall submitted to Mazda’s planning department proposed recycling existing components—a four-cylinder engine, manual transmission, rear axle, possibly even an existing floorpan—to minimize cost. A year later, his idea became an off-line project not slated for production. While the Japanese favored either a front-engine/front-drive or mid-engine/rear-drive coupe, the U.S. team held firm on a front-engine/rear-drive roadster or nothing. This is when the obsessive Hall earned his Ikigai nickname, a Japanese word meaning the reason why one is put on earth. In 1985, Yamamoto recommended the board approve the lightweight sports car, and four years after that it became a reality. Again, most executives—especially conservative Japanese ones—maybe wouldn’t have seen the potential in such a niche project. But the MX-5 Miata lit up the sports car world like wildfire, and its legacy continues today in everything from cheap Craigslist shenanigans to grassroots club racing. Yamamoto retired from Mazda in 1992, closing out his career right around the time the Japanese auto industry saw its wildest ambitions curtailed by a brutal recession. Mazda went from gull-winged kei cars and triple-rotor luxury coupes and dreams of its own luxury brand to severe cutbacks, as did the rest of Japan’s car business. Today, things are a bit more mundane. Weird is harder to come by. A spirit of adventure, even more so. But as Road & Track noted today before I could, Mazda’s still trying crazy things with technology like the SkyActiv-X engine. The company is still small and independent and doing things differently, and in service of drivers. The Miata not only lives on, it thrives today. And if you ask people at Mazda they’re still working on making the rotary engine a thing. I’ll believe it when I see it on dealer lots, but no one can discount the success of the RX-7 for a time. Or of the MX-5 as a consumer car and in motorsports at multiple levels. It is arguably the last car that carries on the wonderful fever dreams of the Bubble Era today. That alone should make Yamamoto a legend. But the fact that he was behind one of the most unexpectedly successful (for a time) and beloved unconventional engines ever made makes him more than that. It means that if you’re a gearhead, if you love speed, and you like your cars just a little bit different than the stuff everybody else is making, you owe him one.